Star King is a classic science fiction novel by Jack Vance. Scifi mystery novels are strange creatures. Quite honestly, I have not come across many, and I haven't enjoyed most that I have come across. One exception is Peter Hamilton's Quantum Murder series (at least I think that's its name). But even there, I felt that the engrossing essence I hunger for in scifi was missing. I felt that I was reading a mystery novel more than a scifi novel. And I generally don't read many mysteries. 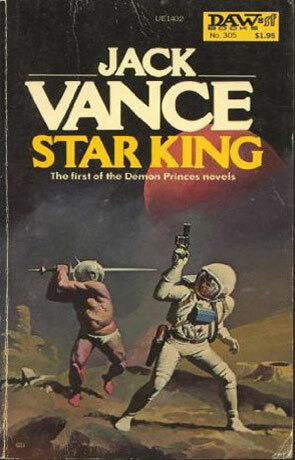 But Jack Vance's Star King proves that a scifi mystery (scifystery? myscifi? (sounds too much like a strange beauty pageant)) can beguile me. And I'm thrilled. I always hate to think that I am denied the joys of a genre due to my own poorly indoctrinated tastes. I hate knowing that I just don't enjoy alternative history novels. So many people do, and I think to myself, if I had just been raised differently, if someone had given me a good althistory book when I was 10, then I would not forever be denied the joys of reading such books. But alas. The Star King is a book about a nebulous man searching for an even more nebulous Demon Prince (the series title is "The Demon Princes") for nebulous reasons. You get the idea... the perfect setup for a mystery. The book opens at Smade's on Smade's Planet. An inhospitable world on which only one structure stands, Smade's. Smade's appears to be a backwater inn frequented by those who don't want to be noticed. The protagonist is staying at the inn for nebulous reasons when he is approached by a Mr. Teehalt, who claims to have found a new planet that is more earthlike than earth. The value of such a planet is enourmous. However, Teehalt is worried about turning the planet over to his sponsor, who he thinks is Malagate the Woe, one of the famed (but nebulous) demon princes of the galaxy. However, during their talk, in walk three of the shadiest characters this galaxy has ever seen. Suddently Teehalt is dead and it is time for our protagonist to get down to business. It is a remarkable story, well crafted, coming togethor well with twists and turns that you might not expect, but could concievably figure out. The best part of Vance's writing style is his ability to recreate the thought processes of the main character. It is a strange metnality, devoted to a purpose yet questioning, insightful while realizing his opponents are at least as insightful as he is, a fighter who thinks while fighting. As you read, you feel like you truly get to know Gersen (the protaganist), and you come to respect him without ever truly liking him. Something about his purpose-driven life is just too foreign. The themes of the book, subtle yet present, are another plus. One theme seems to be how a life filled with purpose should be combined with happy everday activities like dating a woman, eating out, etc. The book also examines how purpose should be questioned, how we should look at the basic motives of our lives. I wish I could present these themes more clearly, but they are wonderfully complex, sprinkled throughout the book. My attempt to codify them in two lines does a disservice to Vance's wonderful book. My only complaint with the book, is that it still seems to lack some of the zest that I find when I read a great scifi book. While Vance's universe is zany, eccentric, odd, entertaining, and meticulously crafted, it is not as engrossing as I would have wished. But please don't let that dissuade you from reading the book. I plan to read the next four books in his "The Demon Princes" series and I consider myself lucky to have the opportunity. It is a great book, and one that I would highly recommend. Written on 24th August 2004 by number 6.